The Gramm-Leach-Bliley Act requires that all companies handling private consumer information have a Red Flag ID Theft detection plan in place. We provide the Red Flag Plan, but also provide an information security plan and an employee training plan to make complying with the law simple. Many states also require proof that lenders have an information security plan in place. This is the ONLY mortgage specific FACTA Red Flags plan in the market. 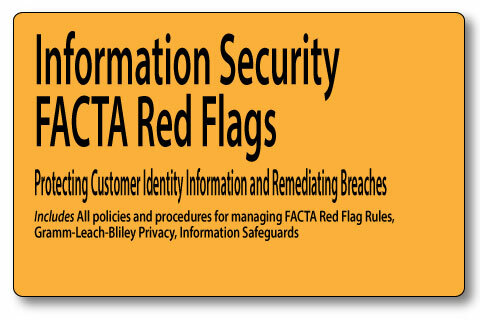 A company can't have a Red Flag rule if it doesn't already have an information security plan. We have combined information security, mortgage origination, processing and closing with this Red Flag program to provide a comprehensive program that can actually be put into use. Essentially, you receive two plans in one.